Oh is the first Asian person to ever host the Golden Globe Awards, as well as the first Asian performer to win multiple Golden Globes. Sandra Oh has won the Golden Globe for best TV drama actress for her role in "Killing Eve," giving an emotional tribute to her parents. The actress thanked her parents, who were in the Beverly Hilton Hotel ballroom Sunday night to watch Oh win her second Golden Globe Award, and also co-host the ceremony. She is the first Asian performer to win multiple Golden Globes, as well as the second person to win the award while hosting the show. Oh had already made history before her win, by being the first Asian person to host the show. Comedian Andy Samberg co-hosted. Oh and Samberg's opening monologue shifted from jokes to real emotions when she talked about the show's diverse set of nominees from films including "Crazy Rich Asians." Oh teared up as she talked about saying yes to hosting despite her fear. "I said yes to the fear of being on the stage tonight because I wanted to be here to look out into this audience and witness this moment of change," said Oh. "Next year could be different, but right now this moment is real. Trust me, it is real, because I see you. All of these faces of change, and now so will everyone else." The pair demonstrated their comedic chemistry at the 2018 Emmys when they presented the award for outstanding director in a comedy series. First, the “Killing Eve” actress tore her envelope in half. She then decided the award should go to whoever came to mind, first giving the honor to Oscars runner-up “La La Land” before settling on Jeremy Park, a high school ex. “We lost touch. I mean, he could be doing anything,” she told Samberg. Oh has been stealing every scene she’s in for the past 30 years. Last year, she became the first Asian woman in history to be nominated for an Emmy in the lead actress role for her portrayal of MI5 operative Eve Polastri in BBC America’s “Killing Eve.” The role also earned her a Golden Globe nomination, as well as a SAG Award nod. She is best known for her supporting role in “Grey’s Anatomy” as Dr. Christina Yang, a role that earned her her first Golden Globe in 2006. If she takes home another award Sunday night, she will become the first Asian woman to win multiple Golden Globes. But despite her multiple award nominations and breakout roles, Oh’s road to stardom hasn’t always been easy. The actress is one of three siblings and was born in Nepean, Canada. Her parents were Korean immigrants. Her dad was a businessman and her mom was a biochemist. Both were deeply religious and wanted their children to pursue careers that would bring good into the world. Decades later, Oh brought her mother to the 2018 Emmys, where she was nominated for the lead actress award. As a teen, Oh landed the title role in a Canadian biopic, “The Diary of Evelyn Lau.” Oh was one of 1,000 women who applied for the role, and she went on to win a Gemini Award, the Canadian equivalent to an Emmy. She quickly followed that as the lead in the feature film “Double Happiness,” which earned her a Genie Award for best Actress in a leading role, the Canadian equivalent of an Oscar. With those two accolades under her belt, Oh took her talents to Los Angeles. Hollywood, however, proved less kind to her. Oh arrived in Hollywood in 1995, where agents made it clear that she was not leading lady material, and she was advised to get plastic surgery. “It was the way that she said, ‘Listen: I’m not going to lie to you. A lot of people are going to lie to you. But I’ve got nothing for you here. I have Suzy Kim’ — I’m just making up names — ‘she has an audition in like six months. There’s nothing for a year,’” she recalled in an interview with Vulture. 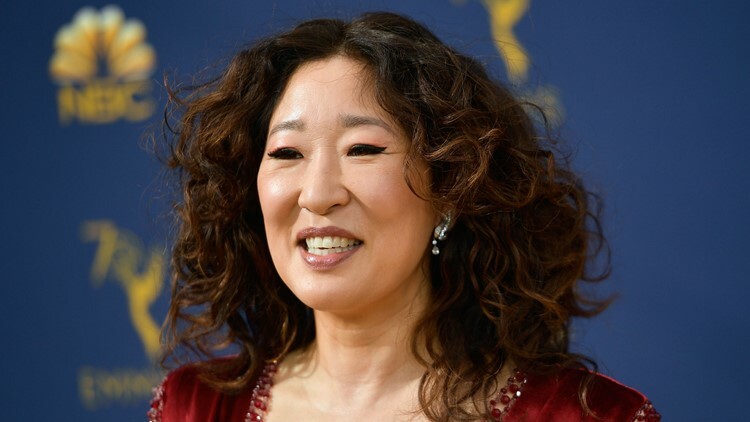 Still, Oh built a career for herself in the U.S. with supporting roles in HBO’s “Arliss,” the 2001 film “The Princess Diaries” and 2003’s “Under the Tuscan Sun.” Then, in 2005, she accepted her breakout role as Dr. Christina Yang in “Grey’s Anatomy.” It became the role is most well known for, and she played Dr. Yang for the next decade, earning her 11 nominations and three wins across several award shows. In 2013, Oh announced she would leave the show after the following season. “It just felt like I did all I wanted to do,” she told Vulture in an interview. "I didn't feel like, ‘Ugh, that's all I can do, I've done everything.’ It was more than that. It was actually, dare I say it, a sense of satisfaction.” But, even with the success of “Grey’s Anatomy,” the leading roles didn’t come in. Oh’s success this year has been a part of a growing body of representation for Asians and Asian Americans in Hollywood. In August, “Crazy Rich Asians,” the first major motion picture with a majority Asian cast to be released since “The Joy Luck Club” in 1993, became the highest grossing romantic comedy in a decade. Actor John Cho starred as the lead role in “Searching,” two years after the #StarringJohnCho movement brought awareness to the lack of Asian representation in leading roles in Hollywood. “To All the Boys I’ve Loved Before,” starring Vietnamese-American actress Lana Condor, became one of Netflix’s most streamed original films of 2018.